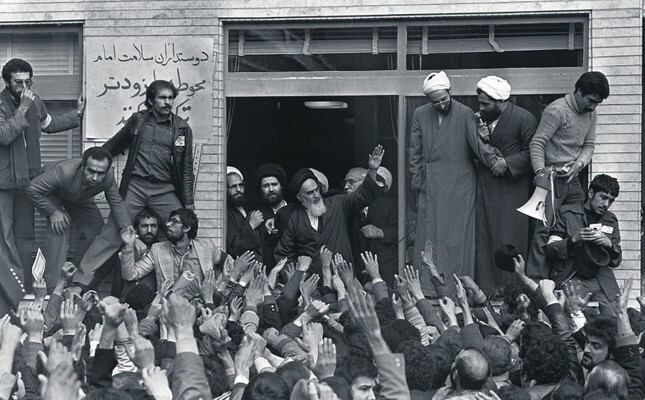 Ayatollah Ruhollah Khomeini waves to his followers on the balcony of his headquarters in Tehran following his arrival in the country as part of a revolution against the Iranian government, Feb. 1, 1979. People marked the 40th anniversary of Iran's Islamic Republic. Iranians overwhelmingly voted "yes" for the establishment of the republic in a historic referendum following the fall of the U.S.-backed Mohammad Reza Pahlavi regime. Along with many missions put into force by the revolutionaries in the Islamic Constitution Law in the sphere of foreign affairs, Iranians endorsed the establishment of the republic with the hope of recovering from poverty, injustices, inequality, embezzlement and corruption. This was one of the revolution's domestic missions. Another mission was to prevent bypassing the laws and regulations in domestic areas, which is still an administrative challenge. The 1979 Iranian Revolution was valuable and exceptional in essence, but questions remain about the way it is managed and its overall performance. It is valuable since its multitude of achievements in particular in the fields of security and defense, and in the health and industry sectors despite decades of harsh sanctions, have prevented the outflow of currency and is reviving Iran's glory. In the same vein, the history of many revolutions teaches us that a revolution occurs for many reasons; one of which is dissatisfaction with the existing condition that emerges from the deep despair of recovery. History also taught us that a revolution is a return to the historical glory and/or establishment of a new desirable era. In this respect, the Iranian Revolution was going to be a revolution in all aspects – politically, economically, industrially, socially and intellectually. Although it is widely believed that a political revolution is a change in government, while social structures remain intact. There is no doubt Western pressure on Iran's Islamic Republic and the subversive functions of fifth-column agents in the system and governments from the beginning have seriously challenged the fulfillment of all aspects of the revolution. The reason behind Western pressure on Iran was the underlying nature of the revolution and post-revolution road map that aimed at introducing a new feature of the Islamic revolution to the world with new resistance against Western hegemony and imperialism. Thus, it has been of an expectation that the revolution would face various challenges. However, there are some aspects that closely related to the nature and structure of the governance and performance of the system itself. So, with reference to my previous opinion articles, it is still vague as to where the Islamic Republic of Iran is heading. Keeping these missions and definitions in mind, the following description of the nature of the revolution may help us understand the domestically originated causes of the complexities and current bewilderment in Iran. The aim of adding "Islamic" before "republic" was to certify that the people and their elected representatives hold the power, with establishment of a certain level of equality, justice, freedom, social rights and economic development. However, there are still some unanswered questions regarding the functional nature of these concepts in Iran. Thus, along with the share of international and Western pressures on Iran, I wonder if the description of "republic" with the concept of "Islamic" was logically justifiable because in the case of the Islamic Republic of Iran, the concept of "Islamic" has not only weakened the status and functionality of republic but also decreased or hindered the roles of the people, even those loyal to the revolution, and their representative nongovernmental organizations. Besides, the system has put the concepts of democracy and republic into the basket of Islamic democracy in order to prove that the system is ruled by the majority and law but in an Islamic context that combines the aspects of theocracy and democracy. Conceptually, it sounds promising and encouraging. Functionally, it has been discouraging. This could be one of the causes of the existing paradoxical complexity, of which the current socioeconomic disorganization and insufficiencies are a part. It has brought with it a radical politicization that hindered the concept or ideology of Islamic democracy with tangible socioeconomic and politico-cultural setbacks. It also caused in the failure of political pluralism and instead resulted in particularism; that is, there has always been the possibility of sabotage in the governance process. The revolution was in essence a start for independence from Western hegemony and support for the oppressed around the globe. It has come with a price, and Iran and Iranians are still paying it. However, their sacrifices could and should have resulted in achievements. The question is whether we should only hold international pressure responsible for this, or does misgovernance weigh heavier? Seemingly, the biggest problem here is that the leaders' and officials' ideologies of governance have mostly been based on "between pillar and post there may be rescue." This is a form of misgovernance or misconduct in the governing process that mostly resembles the nature of a rolling stone. The revolution was not ordinary and did not conform to Western norms. It was a revolt of the whole society at once against the state. There were no divisions in the society in this respect. After 40 years, the situation seems different; there is a division between the privileged classes and underprivileged classes. This has deeply concerned the most important figures, who played sensitive roles in the establishment of the revolution and the post-revolution process. They have announced their deep concerns about the future of the revolution. Dr. Seyed Mohammad Hossein Beheshti, an Iranian jurist, philosopher, cleric and politician known as the second person in the political hierarchy of Iran after the revolution and also the primary architect of Iran's post-revolution constitution, once warned officials that poverty, injustice and inequality in income distribution would threaten the roots of the revolution. We can also find traces of similar warnings in speeches made by Grand Ayatollah Ruhollah Khomeini, the father of Iran's Islamic Republic. The most recent warnings came from other high-ranking officials such as Ayatollah Rafsanjani, Grand Ayatollah Javadi Amoli and other revolutionary figures. These figures concurrently emphasized the necessity of solidarity and unity against imperialism but at the same time warned of misconduct, officials' embezzlement and corruption, the uncontrolled rise in cultural poverty that causes financial and economic poverty, and also socioeconomic challenges. Grand Ayatollah Javadi Amoli in his meeting with Ali Rabiei, the former minister of cooperatives, labor and social welfare, warned that people revolted against the state some 40 years ago for these same reasons, and they could potentially do again. He also stressed that a nation handicapped in unity and resistance cannot stand against imperialism. Iran has all the necessary resources and tools to become both modern and Islamic. Besides, the Islamic Republic of Iran is by no means barred from becoming a modern Islamic country, but it should bear in mind the importance of respecting the underprivileged classes, since they ultimately decide the destiny of the revolution. Concepts cannot always help a state succeed, but the way these concepts are practiced and applied may change the destiny of a state. Perhaps deliberation on the astonishing rise of a state from the ashes of World War I would help Iran not get caught up in abstract concepts but rather to pay attention to performance and governance along with preserving its cultural assets. "A culturally dependent nation may soon become dependent in major areas," emphasized Grand Ayatollah Ruhollah Khomeini in his testament. Such dependencies may threaten peace at home.